To share God's love with people in need through the provision of health care services, sound counsel and related education. healthy, wholesome lifestyles are the norm. The HWCHC offers free primary healthcare services for medically uninsured low income residents of Lancaster, Lebanon and Dauphin Counties. Learn more about Hope Within Community Health Center. Hope Within Counseling Services are offered on a self-pay, income-based sliding scale fee and there are no other eligibility requirements. 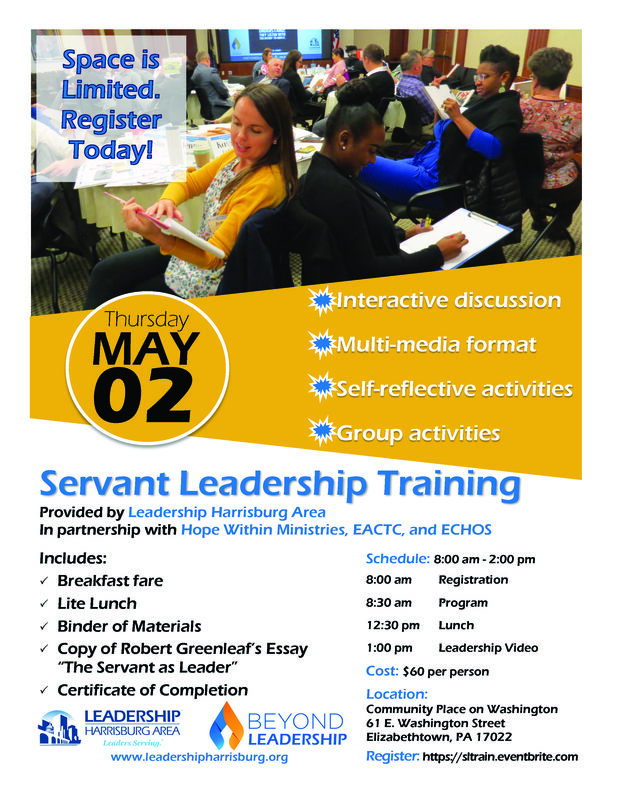 Learn more about Hope Within Counseling Services. Hope Within offers free primary healthcare services for medically uninsured low income residents of Lancaster, Lebanon, and Dauphin Counties. The patient must be medically uninsured OR have Medical Assistance with lack of a reasonably accessible medical home. If you'd like to apply to be a patient of Hope Within Ministries, please apply via the button below. Hope Within Counseling Services (HWCS) offers low-cost mental health services based on an income-based sliding scale fee with no other eligibility requirements. An intake will be performed first. Hours are variable, and an appointment time will be coordinated with the therapist or counseling intern after we review the completed intake. For further information or to begin the intake process, contact Karen Thrush, LMFT, 717-367-9797 X 316. Hope Within relies on and is immensely grateful for the generous support from both medical and non-medical volunteers. Volunteer opportunities exists for health care providers, reception/front office service, nursing, help with fundraising or community outreach events, and miscellaneous ministry projects and needs. We would love to hear from you as to ways you would like to get involved. 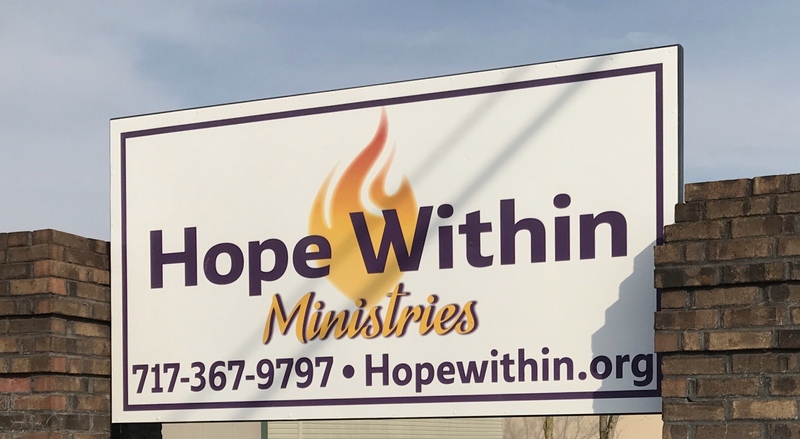 Hope Within has launched our capital campaign, Igniting Hope! This campaign is aimed at raising funds to expand the Hope Within structure to accommodate the growing needs of the community. Hope Within will accept gifts in kind of medical, office and building supplies as well as equipment and furniture as needed. Gifts in kind may be dropped off during at the clinic during clinic hours (see Patient Hours tab or call the office). 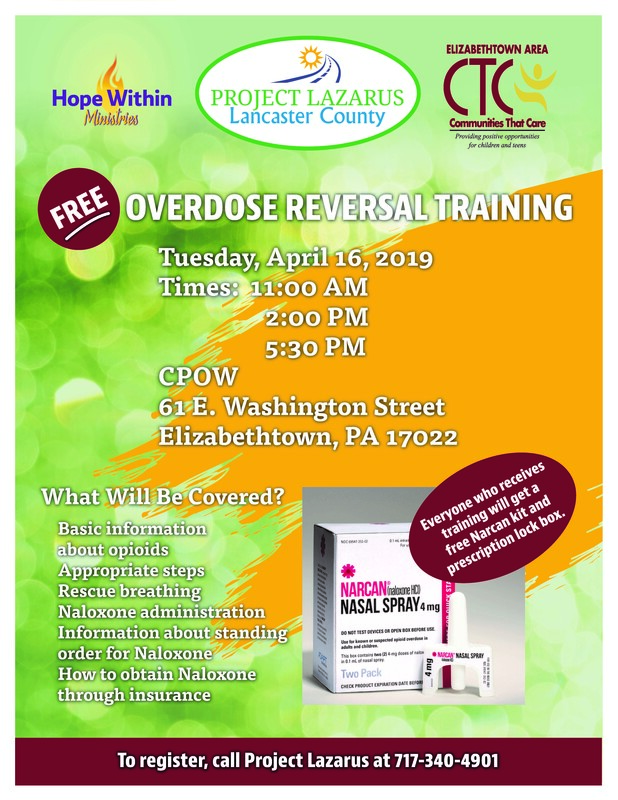 In addition to a Narcan Kit, and a Prescription Drug Lockbox, one $50 GC will be randomly awarded in each session. Learn servant leadership principles, how to improve personal leadership skills, and how to change your organizational culture to a system wide culture of mutual Servant Leadership. Registration and sponsorship link coming soon! Hope Within Ministries will be a part of the 2019 EXTRAORDINARY GIVE. This is a ONE-DAY, 24-hour,on-line day of giving. This is the largest single day of giving in the county and over $10 million dollars was raised in 2018 to support the vital work of non-profits who serve those in Lancaster county. Details will follow.